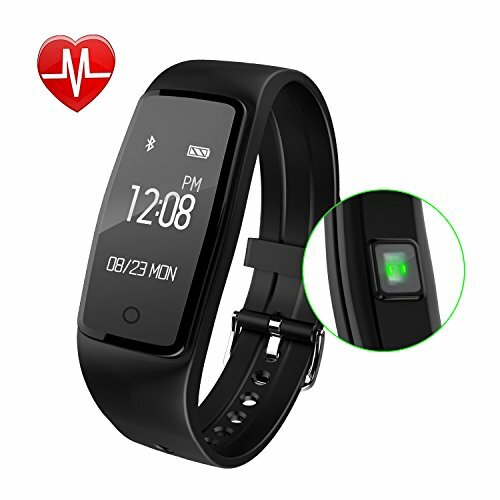 【Fitness Tracker with Heart Rate】The smart bracelet can track your heart rate and all-day activities. It can display steps taken, distance traveled, calorie burned, etc. 【Advanced Design and Comfortable Material】USB WIRELESS charging and IP67 grade waterproof. With a USB connector, it\'s very convenient to charge the built-in battery via charger or computer. It is made of TPE material and only weight 18g, looks thin and fashion. 【Wide Compatibility and Long Battery Life】Our wristband works with Bluetooth version 4.0 or above. Support system: iOS 7.0 or above (iPhone 7/7 plus/ iPhone 6/6S plus/ iPhone 5/5S/5C, etc. ); Android 4.3 or above. High performance rechargeable battery ensures up to 15 days of standby time on a full charge of about 2 hour. Detachable design makes it easy to charge. 【Sleep Monitor】Download and install the free app \"Smart Wristband\" into your smart phone by scanning the QR code or searching in Google Play or Apple App Store. Connect the free app via Bluetooth, data will be synced to the app. It can monitor your sleep quality including deep or light sleep hours, awake hours, history sleep data. You can also set different alarm clocks in the app and it will vibrate to wake you up or remind you to do exercise, take medicine, etc. espinariego perez "probar y contar"